Mark Alsop is one of the most influential and enduring club DJs in Australia’s gay history. He rose to prominence in the '80s and ‘90s, headlining the huge and hedonistic dance parties staged by promoters such as RAT, Bacchanalia, Sweatbox, Pride and the Sydney Gay and Lesbian Mardi Gras (SGLMG). His impact on the underground dance party culture from this era was glorified in “The 80’s are Back” Powerhouse Museum exhibition in 2010 -- but far from being a museum piece, Mark remains as in-demand as ever, some 35 years after starting his DJ career. - Bobby Goldsmith Foundation fundraisers for more than 30 years, most recently at the last three Boy’s Own Bake-offs and the 2017 Community Auction. - AIDS Council of NSW (ACON) and Australian Federation of AIDS benefits from the 1988 Black & White Ball in Canberra, through to ACON's 2015 Testing Week. - AIDS Coalition to Unleash Power (ACT UP) events and demonstrations since 1989. Mark’s outstanding contribution to the LGBTI community was recognised by the 2011 ACON Honour Award in the category of Media, Arts and Entertainment. He won the inaugural Sydney Star Observer People’s Choice Award for Best DJ in 1989 and then again in 1990, as well as the final CAPS Award in 1990 (later known as the DIVA Award). A love of house music has led to residencies at leading gay venues including The Colombian Hotel, Manacle, ARQ, Midnight Shift, Club 45, The Flinders and The Taxi Club, as well as mixed venues such as the Civic Hotel (2001-2015) and Jackson’s on George (1999-2001). The list of community parties Mark has played at is impressive, taking in Mardi Gras (Party, Laneway, Sleaze Ball and Fair Day), Points of Difference Celebration, Barcode, Toybox, Queensland Sleaze Ball, Lismore Tropical Fruits, Paradise Garage, Frisky and All Gay Cruises. A popular figure within the Bear community, he performs for the Harbour City Bears, Bear Nation, Bearstock, and at Honey events in Sydney, Melbourne, Brisbane and Adelaide. Mark has a long-time connection with the leather community, performing at six Inquisition parties. Outside of Australia, Mark has had gigs in Singapore, New Zealand (for the Out Games), Kuala Lumpur, Phuket and New Caledonia. 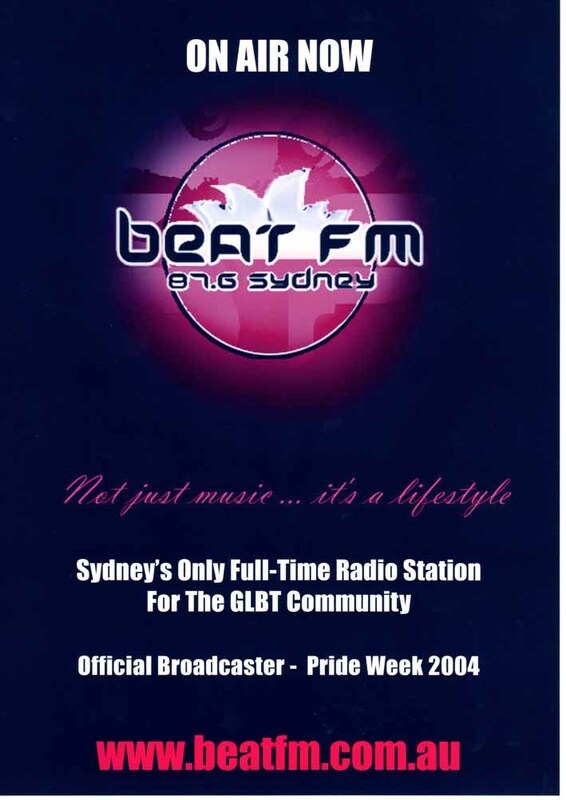 Mark has had guest spots on radio station 2SER, as well as being a presenter on his show MA15+ for BEAT FM, an LGBTI-themed station broadcasting from Leichhardt. Mark was recently featured on the ABC Radio National Earshot program Searching for Trough Man, an audio documentary detailing the history of Sydney’s gay party scene. He also featured in the 2017 book Music Wars: The Sound of the Underground, a history of the Central Station record label and stores as well as the 2008 publication Ambrosia: About a Culture - An Investigation of Electronica Music and Party Culture. His glorious turn as ‘God’ on the SGLMG float ‘God is a DJ’ was described in the 7 March 2009 Sydney Morning Herald article “God – and the godless – take it to the streets” (Josephine Tovey). Mark has demonstrated a deep commitment to, and passion for, the LGBTI community, serving as a role model for long-term survivors. He sees music as a universal language, and considers it an honour to use his skills to benefit a community he is proud to belong to. Be sure to check out Marks presence on Wikipedia, Facebook, Twitter, Podomatic, Mixcloud and i-Tunes. I started DJ'ing way back in 1984 due to a passion to spread a more universal kind of music to the people of Sydney. At this very same time came the news of the newly diagnosed AIDS epidemic in America and the first whispers that it was now appearing in Sydney. Fear quickly ravished our community and oh so many people from within our community were told to enjoy life now, as they would not be around to enjoy anything after the next two years. My reaction was immediate and very clear-cut :- I could use my music as a weapon against the spreading despair, and to help breathe some optimism where it seemed there was none. I developed a deep passion to make sure the word spread loud and clear that no person deserved such a death-sentence (as it was as that time), and I began to unite people on the dance-floor to spread the message of hope and unity. I was there at the very beginning fronting rallies, attending funerals, marching at candlelight rallies and became quite the activist by immersing myself in charity work for ACT-UP. I feel like a grandfather at this stage of my life having witnessed the birth of ACON, PRIDE and BGF, and never thought that I would see the day that the AIDS epidemic is no longer a public health issue in Australia (July 2016). I have been unyielding in my belief that a positive attitude is the core thing that can bring us through such adversity. I still continue to front the many benefit parties and events that include The Luncheon Club, ACON, PRIDE, 2010, Bake Off and many others. I’ve also been known to rattle the BGF collection tin across the city and suburbs. I sincerely hope that within my ¼ of a century (and beyond) involvement with the Gay & Lesbian community that I have had a positive role in helping to pick it up from the depths of despair and helped it to sail through the shroud of death into a positive, vibrant, blossoming community that now have a bright vision of the future. I personally see music as a universal language that levels the playing field for everyone. I enjoy what I do and consider it an honour to use my gift in life to benefit our community that I am so very, very proud to be a part of.